Double Computer Produced Coat of Arms- A beautiful Double Coat of Arms print. 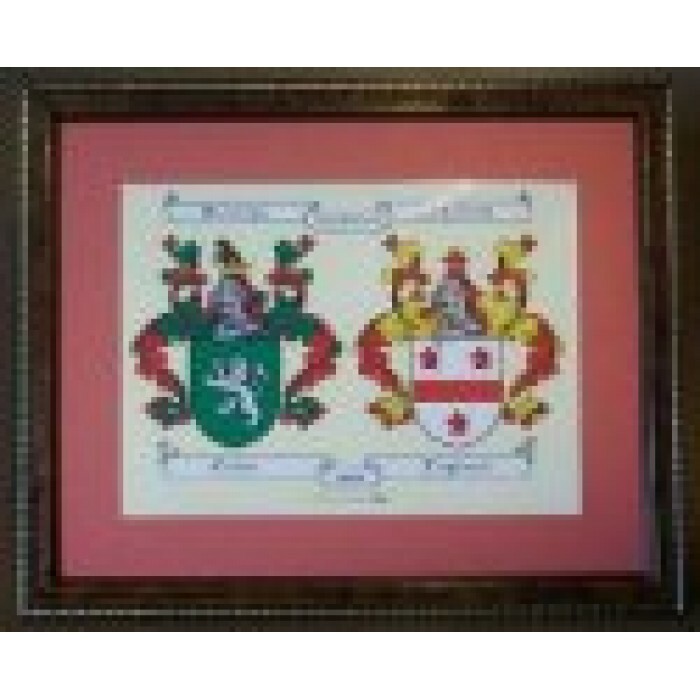 A beautiful Double Coat of Arms print. The perfect way to mark the unity of two families and the ideal wedding or anniversary gift. The ancient traditions of heraldic artistry are revived in these artistic Coats of Arms. These colourful representations will be a treasured and lasting heirloom for generations. A terrific gift for Mom and Dad - maybe for their anniversary. Many order for engagements and weddings too. Honour both sides of your family and present a talking point for relatives and friends. NOTE: It is normal practice in this product to display the Male name on the left and Female on the right.